1) Studying the trending topics on smithsonianmag.com. What appears most frequently? What are bloggers saying about them? How often are visitor experiences and/or the actual museums mentioned? How well does the magazine website integrate current exhibits in promoting discussion or suggesting a visit? This would likely go with the collaborative web. 2) HBO history productions- looking at one or several historically based shows by HBO and how much information they provide on their website to historical sources. What suggestions do they make if people want to know more about a topic? This would go with the collaborative web. 3) Evaluating the peer review process for Wikipedia. How effective is it? How would you know if the person reviewing your work is a professional in their field? Can a non-academic peer review elevate the quality and accuracy of an article? What determines a high quality article from a low one? (focus on history articles) This would go with databases. 4) Looking at the top ten google search results for “online history games”, who is sponsoring the websites? Are they professional organizations? amateurs? etc. How do their games and references to historical sources compare to one another? This would go with discussion of databases. 5) Looking at websites that discuss passionate topics such as 9/11 or the Civil War, topics that have groups who want to point fingers and blame a specific category of people, what do the blog administrators do to promote discussion rather than angry rants? Do they state on their blogs what types of comments will or will not be accepted? How do they keep comments focused on the history rather than personal greivances? This would go with discussion of digital collections. Welcome to History in the Digital Age. This is the public course blog. This is the primary hub of our course. To get started please register for the blog. Start filling in the blanks. Say pithy and amazing things. Your post needs a title, and post content. Please include links and images as relevant. Watch this screencast to see how this works in action. There is more information in the video. Oh, also feel free to stick in links to some blogs you like. Our class might be over, but I’ve really enjoyed the possibilities of creating digital projects to aid researchers in history. Recently, I’ve been trying to do some research that deals with the history of children and childhood. Unfortunately, I’ve found it difficult to find very many sources on this subject, but those that I have found I’ve compiled. Rather than just keeping it all in my own records, I thought, why don’t we keep more of our sources that we find in some online directory to help others who may have the same interests? Well, I already have my dreamhost account, and it’s only another $10 to register another site, so I went ahead and registered a new website on the History of Children and Childhood. I don’t know if anyone from my original digital history course will come back to this website, but I’d be interested in any feedback anyone might have on this new project of mine. So, if you have a moment, check out www.childhistory.org and let me know what you think. When I conceptualized this digital project, ‘MappingWIMS’, I didn’t necessarily realize how challenging building an educational blog could be. The world of blogging- or even just using the blog format- seems to be unstructured and idiot-proof yet requires great attention to detail and know-how. My project was inspired by using personalized mapping tools such as My Maps by Google. 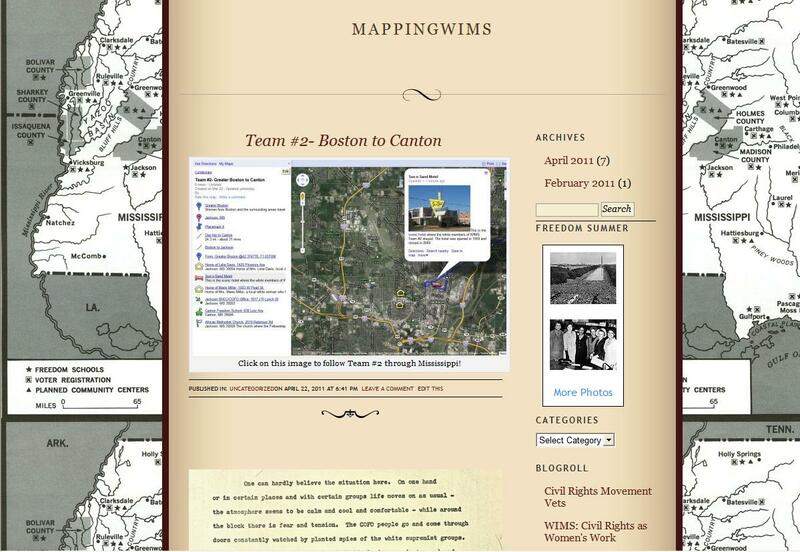 The original idea was to have a personalized map which displayed something of a visual trip log of the civil rights project “Wednesdays in Mississippi” (WIMS) which took place during the 1964 ‘Freedom Summer.’ Since the foundation of this historical project was traveling from the North to the South, I thought that a map, with accompanying contextual information would be a great educational tool. As I began piecing together this project, I weighed using WordPress.com against WordPress.org or Omeka.net. Simplicity and accessibility won out here. Omeka ruled out first because I needed something more quick and dirty. I didn’t have the time or vested interest to learn one my own how to navigate and optimize Omeka. Then I considered WordPress.org, which is obviously similar to WordPress.com, but requires you to download the program. That was simple enough, but when it came to adding plugins and manually managing the blog from my hard drive- I just didn’t have the patience or savvy (or admin power on my work computer!) to make WordPress.org work for me. So that left me with WordPress.com. Also, I wasn’t willing to pay for hosting for a more premium site like WordPress.org since I didn’t yet know how to use it well. So, since I was already familiar with the basic functions of WP.com because of using the online format for class and the blog I run for my interns, I defaulted to that one. Then I really just needed to explore how to make WP.com work for “MappingWIMS”. I was somewhat surprised to find that WordPress.com did not have a map plugin and had blocked <iframe> embedding (which is how Google Maps are written). So what I thought would be a seamless, single site project turned into a kind of dual featured thing. All I managed to do was link the screenshot image of my maps to then navigate to my Google map. The idea was to keep the blog as its own little self-contained, themed experience so that you could reference the other posts and information while moving about this map. For obvious reasons, I was a disappointed with this issue. Perhaps if I had tried an alternative mapping tool, I could have avoided this, but like I said, I’m a dilettante. I feel that I also allowed the content on my blog become inconsistent. In my head, I had imagined it taking much less work to include all the content and context needed to get the whole picture of what WIMS was. Since there’s next to nothing available about WIMS as far as secondary sources go, I found myself trying to throw up primary sources to legitimize the maps/historical accuracy, but then having to narrate and interpret all of the posts became more of a research project than anything else. As Dennis mentioned with his History Comps website- this is a lot of research and manual labor! The way my blog exists now is not my ideal and I think I might continue to improve upon it just for my peace of mind. Further, I mentioned during my presentation that I was worried about almost ‘spilling’ about WIMS. I had had a little brush with the daughter of a WIMS team leader which put me on the defense a bit. Then after working with a doctoral student who has been writing her dissertation on WIMS for over five years, I began to feel a little sheepish about so casually using this information like people’s names, former addresses, etc. In the bigger scheme of things, what this predicament indicated to me is that ‘getting published’ at this day in age is as simple as opening a blog account. As we discussed early on in this class, print journalism is no longer restricted to newsprint and official sites. Whether I’m a seasoned, globetrotting, investigative journalist or some random employee at a tiny archive, if I have control over publishing some of the only information about a particular subject on the web- then people will read it, and probably believe it! ﻿Using my privileged access to primary source information and translating it directly to the web and intermixing it with preexisting web sources, rather than writing a full length book, feels like I’ve transgressed some sacred ritual. Even with the advent of WikiLeaks, breaking news by way of Twitter, and the temporal life of Facebook… I’m not sure that a blog like MappingWIMS, as some of the first evidence on a historical topic, is the right way to go about ‘it’. Conversely, perhaps the fundamental idea behind this class is to inform new scholars that all is fair in web and technology? At the start of this paper, I was excited to explore the translation of the Freer Gallery of Art to the digital platform of the Google Art Project. Of course as a student in Art History, being able to explore museums abroad from my dorm room is a great tool. Yet the experience presented by a museum in a digital format is a much different one from the traditional museum-going experience. My findings for this paper – that there is really no viable substitute for the physical experience of an art museum – were perhaps colored from the start by the fact that I am an art historian. Viewing the works of great masters in person is ethereal, and often changes the way one has previously imagined a work to look or the emotions it can evoke. However, after digging into the literature on the museum experience as a result of many variables (architecture, display tactics, lighting, etc. ), it seems that the majority feel that the museum experience is one of an almost “spiritual” connection to the objects housed within, and ultimately disseminates some form of enlightenment from a close proximity to those objects. With that said, I was surprised to find that some of the points from Cohen and Rosenzweig’s book ( the first reading done for our class) meshed with this same feeling of “loss” inherent in the digitization of physical history. 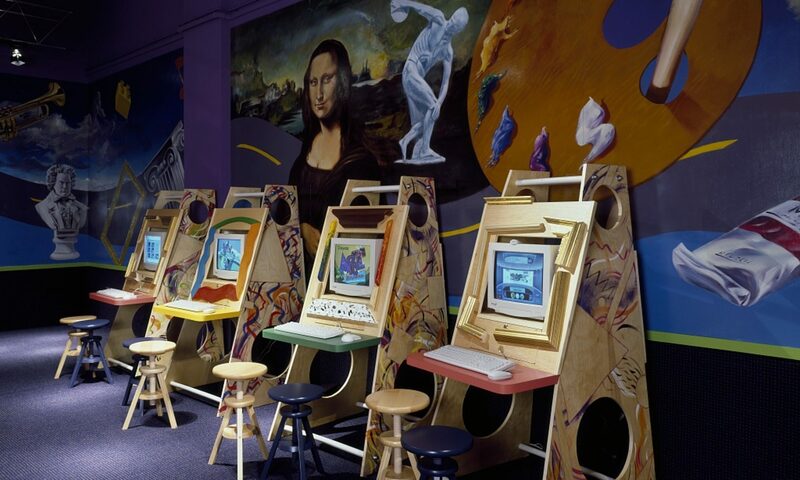 Moreover, they felt that digitization does not necessarily mean “accessible” (economically speaking), a point of contention I personally had with the Google Art Project. While I did not entirely buy into the Google Art Project, though, its viability as a supplement to physical visits is undeniable. All in all, I found the process of “visiting” both the physical and virtual Freer Gallery of Art and documenting the respective experiences to be an illuminating one. The process also made me appreciate being in DC, a place where one has access to so many renowned museums and thus occasion for “spiritual” and intellectual enlightenment.